Conny Ochs envisions the signs, concealed and hidden to others, he is able to read the world much more detailed and in higher density. The results of his observation he channels into narratives driven by fervour and vulnerability. 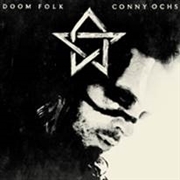 The album 'Doom Folk' walks new tracks but sometimes they are just running parallel to the old paths. The record is still a true Conny Ochs album, coming from dark and melancholic dreams, wrapped in songwriting full of urgency and bittersweetness.